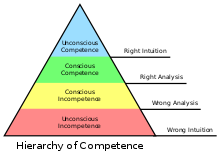 In psychology, the four stages of competence, or the "conscious competence" learning model, relates to the psychological states involved in the process of progressing from incompetence to competence in a skill. Management trainer Martin M. Broadwell described the model as "the four levels of teaching" in February 1969. Paul R. Curtiss and Phillip W. Warren mentioned the model in their 1973 book The Dynamics of Life Skills Coaching. The model was used at Gordon Training International by its employee Noel Burch in the 1970s; there it was called the "four stages for learning any new skill". Later the model was frequently (but incorrectly) attributed to Abraham Maslow, although the model does not appear in his major works. The four stages suggest that individuals are initially unaware of how little they know, or unconscious of their incompetence. As they recognize their incompetence, they consciously acquire a skill, then consciously use it. Eventually, the skill can be utilized without it being consciously thought through: the individual is said to have then acquired unconscious competence. Several elements, including helping someone "know what they don't know" or recognize a blind spot, can be compared to some elements of a Johari window, although Johari deals with self-awareness, while the four stages of competence deals with learning stages. ^ Broadwell, Martin M. (20 February 1969). "Teaching for learning (XVI)". wordsfitlyspoken.org. The Gospel Guardian. Retrieved 11 May 2018. ^ Curtiss, Paul R.; Warren, Phillip W. (1973). The dynamics of life skills coaching. Life skills series. Prince Albert, Saskatchewan: Training Research and Development Station, Dept. of Manpower and Immigration. p. 89. OCLC 4489629. ^ Adams, Linda. "Learning a new skill is easier said than done". gordontraining.com. Gordon Training International. Retrieved 21 May 2011. ^ Hansen, Alice (2012). "Trainees and teachers as reflective learners". In Hansen, Alice; et al. (eds.). Reflective learning and teaching in primary schools. London; Thousand Oaks, CA: Learning Matters; Sage Publications. pp. 32–48 (34). doi:10.4135/9781526401977.n3. ISBN 9780857257697. OCLC 756592765. ^ a b c Flower, Joe (January 1999). "In the mush". Physician Executive. 25 (1): 64–66. PMID 10387273. Conger, D. Stuart; Mullen, Dana (December 1981). "Life skills". International Journal for the Advancement of Counselling. 4 (4): 305–319. doi:10.1007/BF00118327. Engram, Barbara E. (October 1981). "Communication skills training for rehabilitation counselors working with older persons". Journal of Rehabilitation. 47 (4): 51–56. PMID 7321003. Lipow, Anne Grodzins (Summer 1989). "Why training doesn't stick: who is to blame?". Library Trends. 38 (1): 62–72. hdl:2142/7651. Beeler, Kent D. (Winter 1991). "Graduate student adjustment to academic life: a four-stage framework". NASPA Journal. 28 (2): 163–171. doi:10.1080/00220973.1991.11072201 (inactive 2019-03-14). Underhill, Adrian (January 1992). "The role of groups in developing teacher self-awareness". ELT Journal. 46 (1): 71–80. doi:10.1093/elt/46.1.71. Naidu, Som (January 1997). "Collaborative reflective practice: an instructional design architecture for the Internet". Distance Education. 18 (2): 257–283. doi:10.1080/0158791970180206. Lee, Jiyeon; Gibson, Chere Campbell (September 2003). "Developing self-direction in an online course through computer-mediated interaction". American Journal of Distance Education. 17 (3): 173–187. doi:10.1207/S15389286AJDE1703_4. Goldfried, Marvin R. (March 2004). "Integrating integratively oriented brief psychotherapy". Journal of Psychotherapy Integration. 14 (1): 93–105. doi:10.1037/1053-0479.14.1.93. Donati, Mark; Watts, Mary (November 2005). "Personal development in counsellor training: towards a clarification of inter-related concepts". British Journal of Guidance & Counselling. 33 (4): 475–484. doi:10.1080/03069880500327553. Lazanas, Panagiotis (January 2006). "A new integrated approach for the transfer of knowledge". South African Journal of Higher Education. 20 (3): 461–471. doi:10.4314/sajhe.v20i3.25588. Cutrer, William B.; Sullivan, William M.; Fleming, Amy E. (October 2013). "Educational strategies for improving clinical reasoning". Current Problems in Pediatric and Adolescent Health Care. 43 (9): 248–257. doi:10.1016/j.cppeds.2013.07.005. PMID 24070582. Getha-Taylor, Heather; Hummert, Raymond; Nalbandian, John; Silvia, Chris (March 2013). "Competency model design and assessment: findings and future directions" (PDF). Journal of Public Affairs Education. 19 (1): 141–171. doi:10.1080/15236803.2013.12001724. JSTOR 23608938.